United tried really hard to get my trip to New Orleans off to a bad start -- 2 hour flight delay, meaning I got in at about 2 in the morning. Somehow, this turned out not to be a problem. I watched a bad but enjoyable movie on the flight -- Beastly, which I'll give 2 1/2 stars. (It's not actually *good*, but it's enjoyable despite itself. Or maybe that's just because it's Beauty and the Beast, and I have a hard time not liking that story.) Also finished a cover letter (for a position which, unfortunately, no longer existed when I went to submit my application). And, best of all, was picked up from the airport by friends old and new, and taken straight to Cafe du Monde for beignets. Spent the next day hanging with friends and eating lots of tasty things. Brunch omelette involved alligator sausage, but I was more excited about the crawfish and crabs we had later -- fantastic! How good was this day? We were, at one point, literally sitting at the end of a rainbow. No, really! Have been enjoying spending time with my best friend, M.. Have seen my brother and future sister-in-law mostly in the evenings -- they're busy with last-minute wedding prep, which I've been happy to eavesdrop on, and to lend an opinion when asked. 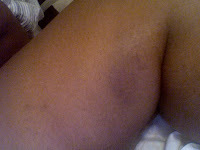 I do not bruise easily. Much more fun: here's a fabulous present, given to me by M.M., a friend of M.'s with whom I should totally hang out. Our kind of flava takes time, y'heard? So cool your jets l'il piggies. We move at the speed of real BBQ."